Which is the best unit of measure for angles — revolutions, degrees, or radians? We seldom learn to use the simplest, most natural unit of measure for geometric angles, the revolution (rev). Other names for this unit are full circle, turn, full turn, and rotation (rot). These are all good names and they all mean the same thing. In elementary school, we learn that angles are measured in degrees (°). Historical note: The number 360 comes down to us from antiquity. 360 was useful to ancient astronomers because it is approximately the number of days in the year. Also, it is useful because it is divisible by 2, 3, 4, 5, 6, 8, and 10. But the number 360 is arbitrary, not fundamental. If the ancients had defined the full circle to be some other number of degrees, then we'd be using that number today. In high school trigonometry and calculus classes, we learn that mathematicians prefer radians (rad). Note: If you have not yet learned about radians in school, you may ignore the radians in everything below. Historical note: The radian was invented in the 1700s by mathematicians who wanted to define angles rationally, not using any arbitrary numbers like 360. They could have rationally defined the full circle to be 1, but instead they defined the full circle to be 2π, the circumference of a circle of radius 1. This definition simplified many equations, especially equations at the deepest levels of mathematics, by removing factors of 2π. However, it complicated many other equations, especially equations involving simple geometry, by introducing factors of 2π. The main problem with radians is that the base unit, one radian, is awkward: 1 radian = 180/π° = 57.2958°. This is perplexing and useless for normal people. Nobody ever builds anything that has an angle of 1 radian, 2 radians, or any integer number of radians. Unfortunately, mathematicians have deep reasons for keeping radians, so we are stuck with them. Let's compare revolutions and degrees (and radians). To convert from revolutions to degrees, multiply by 360. To convert from degrees to revolutions, divide by 360. 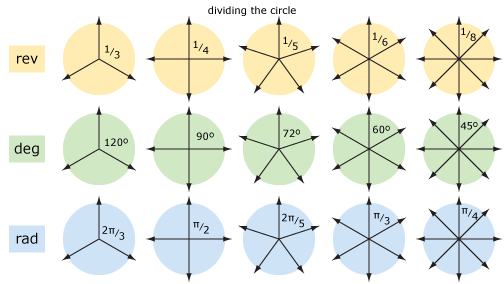 When you use degrees you are often working with integers, but when you use revolutions (or radians) you are often working with fractions (or decimals). Hand calculations are sometimes easier when you use revolutions but sometimes easier when you use degrees. It's good to know both ways. Revolutions (turns) are a more rational and natural unit of measure than degrees. You'll get a deeper understanding of angles if you think about revolutions rather than degrees. An angle is more fundamentally a subdivision of a circle rather than a sum of degrees. For example, a right angle is more fundamentally a quarter of a circle rather than a sum of 90 degrees. Let's divide the circle into n equal sectors (see diagram below). 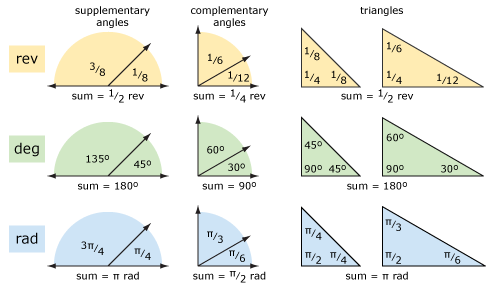 The angle of each sector is 1/n rev = 360/n° = 2π/n rad. It is easier to understand this if you think about revolutions rather than degrees (or radians). Let's look at some basic geometry using revolutions and degrees (and radians). The diagram below shows supplementary angles, complementary angles, and triangles. The concepts are clearer if you think about revolutions rather than degrees. The arithmetic may be easier using degrees if you have trouble adding and subtracting fractions. 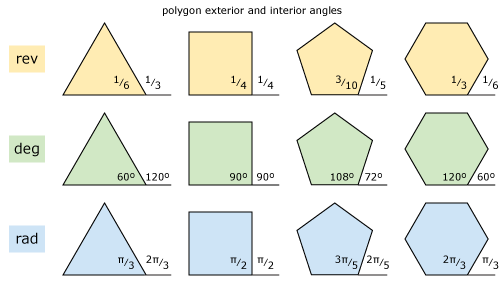 Let's look at polygons (see diagram below). For a regular polygon with n sides, the exterior angle is 1/n rev = 360/n° = 2π/n rad. It is easier to understand this if you think about revolutions rather than degrees (or radians). The interior angle is the supplement of the exterior angle. I think it would be good if teachers would introduce revolutions (turns) at the same time that they introduce degrees. This will help the students to understand angles at a more fundamental level, less dependent on the arbitrary magic number 360. Teachers already introduce the general concept of revolutions (turns) when they say things like "a full circle is 360°", but they can make the concept more numerically precise by saying "a full turn is 360°, a half turn is 180°, a quarter turn is 90°, and an eighth turn is 45°" or writing "1 rev = 360°, 1/2 rev = 180°, 1/4 rev = 90°, and 1/8 rev = 45°". Students should occasionally practice doing a few calculations using revolutions (turns) rather than degrees. Of course, students will need to spend most of their time learning to calculate with degrees (and later, radians), because that is the standard. Finally, let's take a quick look at more advanced mathematics: trigonometry and calculus. We can consider using revolutions with trigonometric functions (sine, cosine, tangent). For example, instead of saying cos(60°) = 1/2 or cos(π/3) = 1/2 using radians, we might want to say cos(1/6) = 1/2 using revolutions. But this is not practical because we depend on calculators to evaluate the trigonometric functions, and calculators typically have only DEG and RAD modes, not REV mode. When we go to deeper levels of mathematics, such as calculus and mathematical analysis, it turns out that radians are the most rational and natural units. For example, consider this fundamental equation: the limit of sin(x)/x as x approaches 0 is exactly 1. This equation would not be so elegant if we used any unit other than radians.